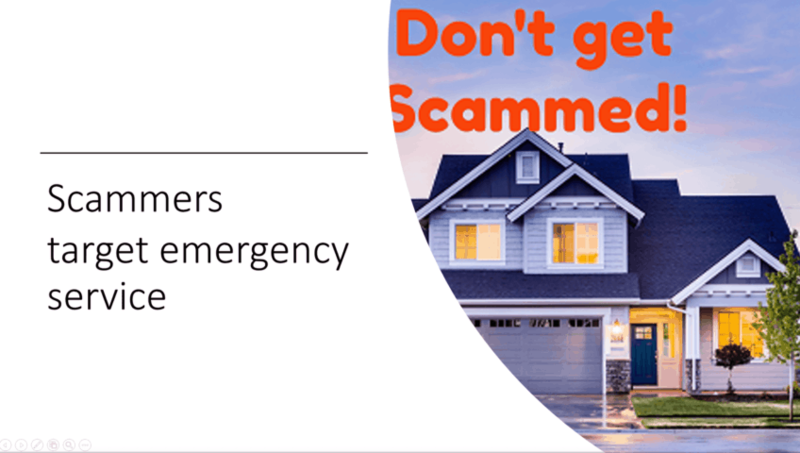 Unfortunately, emergency service repairs of all kinds are the target of scammers and garage door repairs are a particular target. In the last several years, every national trade association for the door industry has published articles about the problem. Newspapers and TV news channels around the country have done stories. The Federal Trade Commission and state attorneys general have taken action. It has gotten so bad that Google recently sent out a message to garage door dealers to take extra steps to verify we are legitimate door dealers. Google has initiated an advanced verification system for all garage door businesses. This has been done in an attempt to remove fraudulent garage door businesses in Google search. Owns over 500 website names that sound like legitimate locally owned businesses, causing confusion about who you have contacted. Fortunately, it takes just a few minutes to make sure that you are dealing with a reputable repair company. They ask for your zip code at the beginning of the phone call. This is a sign that you are talking to a remote call center, not a local company. The company name is vague and not specific. They want you to confuse them with a local business. The address they give is suspicious for example, downtown or in a strip mall. They don’t want you to be able to track them down or it is a sign that they farm out all of the work. The price they give is unreasonably low for example, $29.95 for broken spring. Later you will be given a much higher price. What is your company address? Are your service technicians employees or independent contractors? What is your company’s website? A broken spring or cable. Gears in the opener are stripped. If you can hear the motor running but the door is not moving this may be the problem. Safety eyes are out of alignment or there is something blocking the light sensors. Know typical prices for commons garage door repairs. Note these prices are provided to give you a ballpark price. Your actual situation will be different. New springs. Our price is typically $120 to $225. We recommend that you replace both springs at the same time to prevent another service call. New track one complete side installed our price is typically $75 to $185. "Thanks for the great service. Replace circuit board which saved us $200.00. Matt was friendly and efficient." 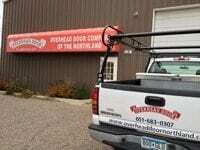 What we at Overhead Door of the Northland do about it? All our trucks have our red ribbon Overhead Door logo and our phone number on them. Our service people all wear a shirt with their name and our ribbon logo on it. "Congratulations! We are happy to inform you that Google's advanced verification process has been successfully completed for Overhead Door Company of the Northland"
Go here, www.dooreducation.com/videos, to see four videos reviewed and approved by the two national door trade associations DAMSA and IDS.